And we're back with another packed episode of Audio Theatre Central; this time it's back to normal programming. 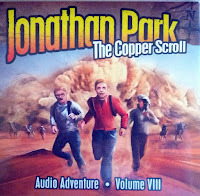 We review Volume 8 of the Jonathan Park drama series which is titled The Copper Scroll. We also interview Pat Roy, the co-creator, writer, director and producer for the Jonathan Park series. Roy also brings us an abbreviated newscast as news is a bit slim right now. You'll also hear two short samples from The Copper Scroll album. Adventures in Odyssey swag now available! Andrew mentions the Political Thrillers series by Joel C. Rosenberg which includes a book titled The Copper Scroll. Send us your feedback! We’d love to hear what you think! Leave a comment below, email us at feedback@audiotheatrecentral.com, or give us a call or text 623-688-2770.